So the fish are still chewing on area lakes. Water temperatures on Gaston and Kerr, as well as other lakes have the stripers feeding heavily. The fish are schooled up in 30 plus feet of water and you can literally catch a limit with one pass; if you have the right setup. 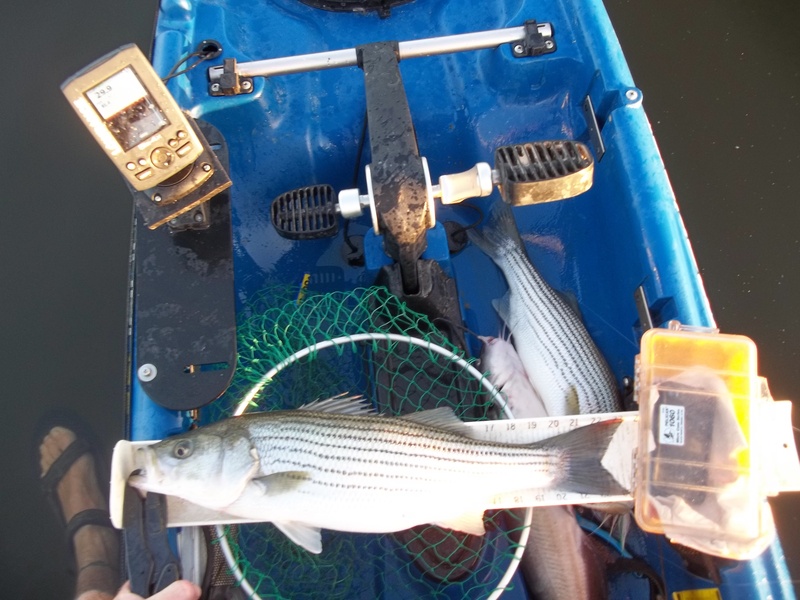 I left the boat at the dock as I needed to log some more fish for kayak wars. So I took the Native Mariner and set out at dawn with 2 rods double-rigged with white and green bucktails. I also used white and green worms and flukes for trailers. The first hookup was just after sunup and both rods went off simultaneously. All 3 fish were just under keeper size for the lake, but 1 rod had 2 fish and the other had the single. I had a few singles here and there also, but after an hour or so on the water, I had the best of my two triples for the day. One rod went off and it felt huge. While I was fighting it, and keeping myself pedaling along, the other rod went off again! 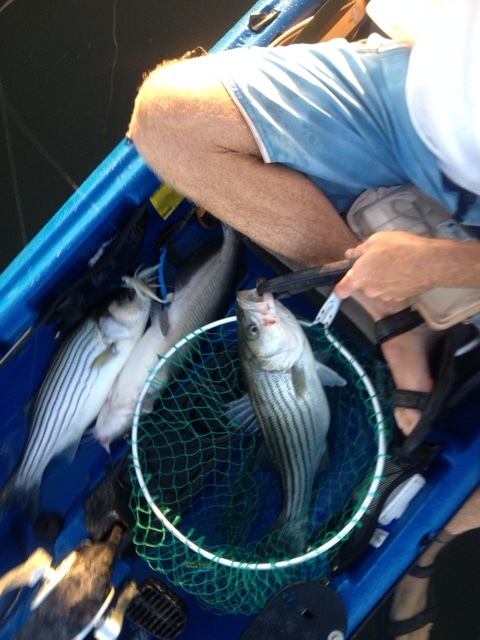 I brought the first catch in, a striper, catfish double, (that’s why it felt huge) then brought in the second rod with another striper (feature photo). Several of the fish were well over 20 inches with one just under 25 inches and probably 6 pounds. Only one store was open at 5:00am this morning and they were out of ice, so I didn’t have the cooler with me. So all fish were released alive as quickly as I could get them dealt with and back into the water. They seemed to be doing fine, and there were no floaters by the time I left the lake. 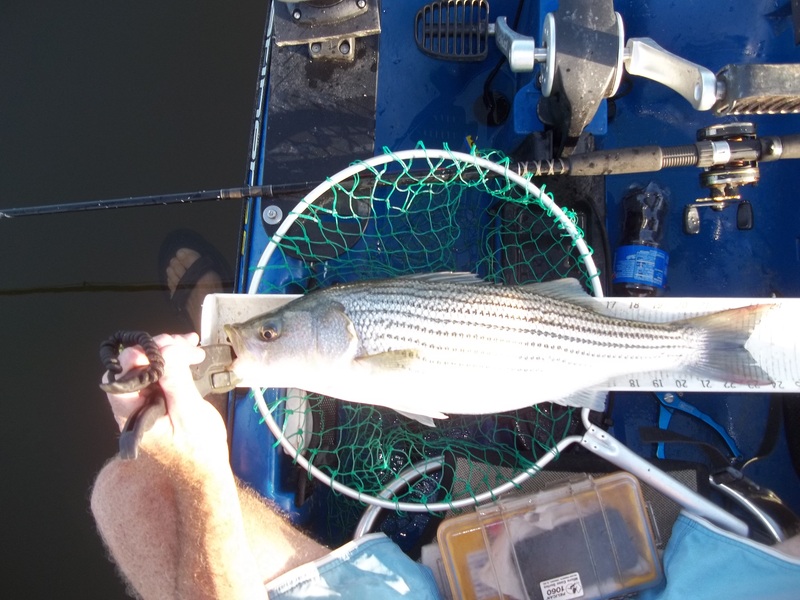 Summer is especially hard on stripers because their metabolism goes into overdrive. They have to eat a lot more than usual to keep weight on and if they are fought too long they will likely stress and die. So it is very important this time of year to use medium heavy tackle when playing these fish. 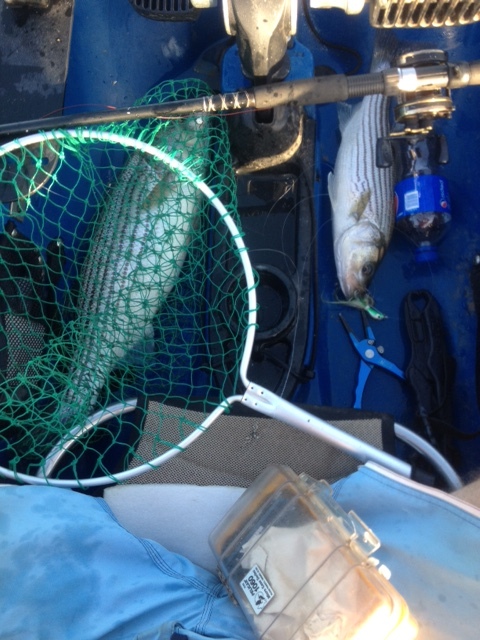 It’s a lot of fun to fight striped bass on medium gear, but its bad for the fish when its so hot. I was using 2 medium-heavy Ugly Sticks with bait feeder reels spooled with leadcore. I was able to stay on the fish, which stayed in 30 feet of water all morning, but had to follow the bite down. At first they were busting and feeding heavily 10 feet down. But soon I had to let out another color as the marks were showing at 15 feet. 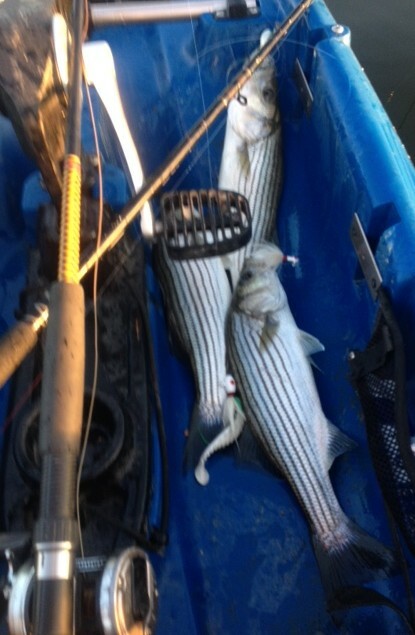 Then finally I had 3 colors out plus the bucktails, which had me catching fish 20 feet down til I left. All fish were caught on bucktails and nothing looked at a crank bait. The last multiple hookup was around 9:00am and the fish hit the jig 20 feet below the surface. Both fish were on the same rod so it was quite a fight. They took line repeatedly actually seeming to work together. This normally doesn’t happen with multiple hookups because you can feel them fighting each other as you reel in. I thought I had one big fish, but the biggest of the pair was 24″ and perhaps another 6 pound fish. Leadcore is crucial for flat-lining, as it eliminates any doubt where your lures are running; of course if you know your speed. This can be done with any gps; handheld or on your fish finder. I was on the water from 5:30 to 9:30 and left before boat traffic showed up. Great Sunday on the lake. Some pics of the nicer fish. 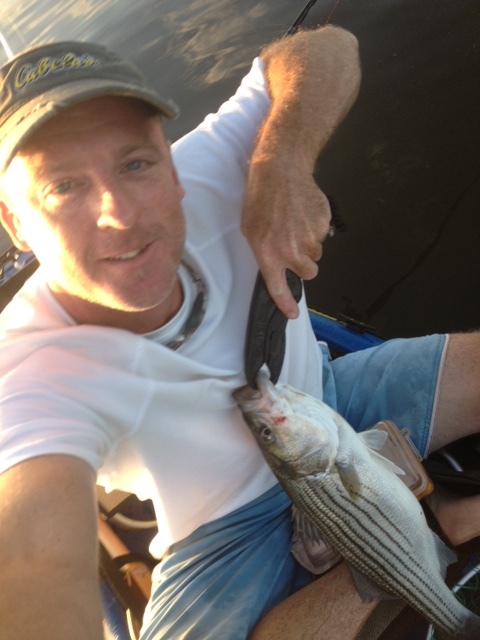 ← Summer Striper Fishing is Heating Up…Doubles! I think that you could do with some pics to drive the message home a bit, but instead of that, this is magnificent blog. There are pics Karolyn. But thank you for reading. put up higher! Come on over and visit my web site . blog post or vice-versa? My site covers a lot of the same topics as yours and I believe we could greatly benefit from each other.